A highly influential Czech historian and politician, František Palacký (1798-1876) became in 1825 the first editor of the journal of the Bohemian Museum, a key cultural institution in the development of Czech nationalism. He was actively involved in the nineteenth-century Czech national revival, helping also to found the Czech national theatre. Entering politics in 1848, he served as president of the Prague Slavic Congress, and later became a member of the Austrian senate as a supporter of greater Czech autonomy. 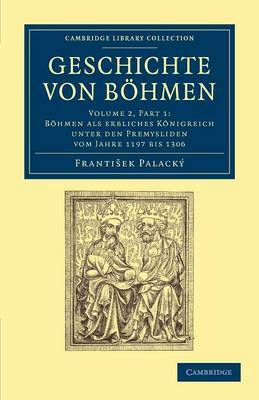 In this extensive work, comprising ten separate parts - published in German between 1836 and 1867 - Palacký gives a detailed account of Bohemian history until 1526. It remains an important and ambitious feat of scholarship, still relevant to students of central European history. The first part of Volume 2 (this is the 1847 printing) covers the rule of the Přemyslid dynasty in the thirteenth century.